Merger & Acquisition activity has been booming in 2015 so far, with a wide variety of mega-deals announced in industries such as high-tech, pharma, foods and energy. More and more, patent portfolios constitute an important part of the final price paid in technology-intensive industries. Often though, apart from the number of patents acquired, the overall impact of an acquisition on the acquiring firm’s technology portfolio largely remains a black box in deal announcements and analyses. Let’s turn to network analytics to show how we can visually analyze the impact of an (intended) acquisition on pre- and post-merger technology portfolios. The first few months of 2015 saw significant M&A activity, with quite a few notable $10 billion+ deals: food giants Kraft and Heinz announced a merger worth an estimated $50 billion, oil and gas powerhouse Royal Dutch Shell announced its intention to acquire UK-based BG Group for $70 billion, pharma giant Pfizer takes over Hospira for $17 billion, and Dutch semiconductor firm NXP announced the acquisition of US-based Freescale Semiconductor for a little less than $12 billion. All these deals include the transfer of significant intellectual property portfolios as part of the overall price. Most press releases and deal analyses make note of the technological complementarity of the acquiror and acquiree, sometimes including indications of the number of patents involved. To further strengthen these bits of information, it would also be worthwhile to take a visual look at how the technology portfolios of the buyer and the target complement each other. As an example, let’s take a closer look at the acquisition of US-based semiconductor firm Freescale by the Dutch NXP, announced in March this year. With a total deal value of $11,8 billion, this is one of the larger deals announced so far this year, and includes thousands of patents which we can analyze from a network analytical perspective. As is common in high-tech industries such as semiconductors, NXP and Freescale both hold significant patent portfolios related to their key technology areas. Until March 31 2015, a total of 13,299 published patent applications exist which list NXP as (one of the) applicant(s); similarly, 11,093 records relate to Freescale. In terms of unique technologies, these numbers are however quite inflated since they include multiple applications for the same invention in various jurisdictions (for example, one invention for which applications are made in the US, Europe and Japan). To focus on unique technologies and avoid double entries for the same inventions applied for in multiple countries, the dataset used here thus only includes the representatives of so-called patent families, being groups of patents applied for in various countries sharing the same initial invention. Patent records were collected based on ‘NXP’ or ‘Freescale’ appearing as the currently assigned applicant on patent frontpages. This then also includes all patents which were re-assigned after the respective divestments from Philips (in case of NXP) and Motorola (in case of Freescale). When only including patent family representatives, the final dataset totals 3,141 patents for NXP and 4,907 patents for Freescale. That’s pretty interesting, since the initial search resulted in more patents for NXP. This is most probably due to the fact that NXP filed applications for its technologies in more jurisdictions than Freescale, leading to the removal of more duplicates. In the end, Freescale thus seems to have more unique inventions in its overall portfolio. Each patent lists one or more technology classification codes on its frontpage, assigned by patent examiners during a patent’s initial application phase. These codes are assigned based on the technical area(s) in which the invention resides. When two patents share at least one of these classification codes, we can assume they at least partly overlap in terms of the underlying technology they describe. This is also exactly how the networks here are constructed: all nodes in the network are patents, while all connections between patents are made based on shared technology classifications. This then allows to create network maps of interconnected technology areas. Colors are algorithmically assigned to patents based on the cluster they reside in – patents close to each other received the same colors. 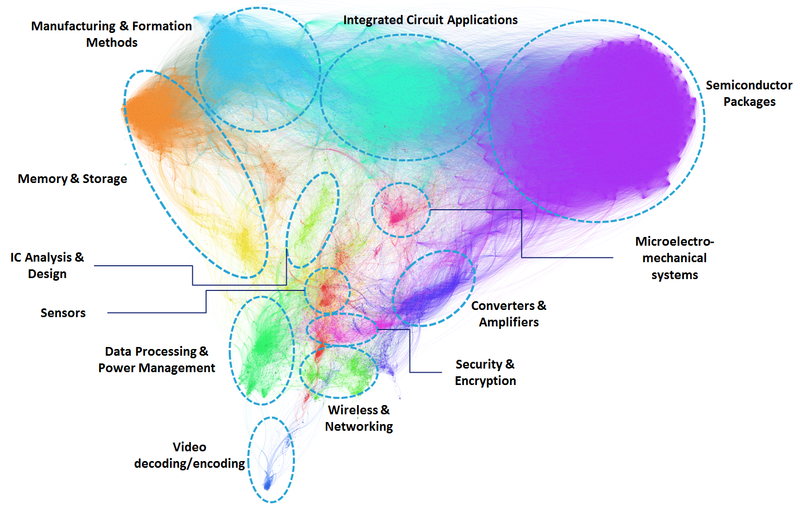 We see various clearly identifiable technology clusters in NXP’s current patent portfolio, with activity across many subfields in semiconductor Research & Development. Some clusters hold hundreds of patents, while others are smaller in size but do have bridging positions in-between larger technology areas. With the acquisition, NXP may have the intention to further build its position in a number of these areas, or perhaps even enter areas in which no R&D took place previously. Let’s take a look at the combined technology portfolios to see what the implications of the acquisition are from a technological point of view. 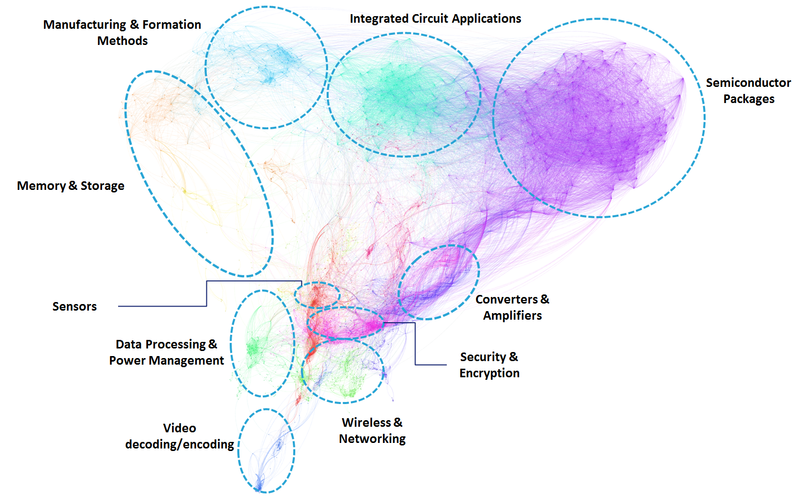 The combined picture showing both NXP and Freescale patents in the same network proves that the two are a definite match: all NXP’s initial technology clusters are strengthened significantly by the addition of Freescale’s patent portfolio. The two companies are highly complementary indeed from a technology perspective. The three clusters on top are further reinforced by the addition of hundreds of patents in the same areas, while other areas in which NXP was less active, such as Memory & Storage, are enhanced extremely well by the addition of Freescale technology. Analyses such as the above can shed new light on the actual potential of an M&A deal by providing a visual overview of which existing technology areas are strengthened most, and which previously untapped or less active areas are invested in most significantly. When slightly changing the network’s assumptions, network analytics also allows to obtain a unique look at the strength of the overall R&D workforce within an organization when constructing networks of connected inventors and knowledge clusters within organizations. Combined with the perspective shown in this article, this can provide an acquiring firm with an improved view on the actual strength of the potential target’s R&D capabilities, enabling dealmakers to add a further visual and quantitative dimension to their strategic analyses.